Now I did not actually read that email until the morning of April 10th. So I have already missed one day of the 3 day sale. The good news is that I get up at 4:45 AM so I had the ability to create an ad before I left for work that day. On the evening of April 9th I actually downloaded a Photoshop file that was created by Teespring. It is a free file that has some create button, backgrounds and layouts. If you use Photoshop then you need to download this free file. When you open up that free graphic file from Teespring, you will see a very nice layout that has a light green background with a white border. I took this and then added a picture of 3 kettlebells. I modified the text in their button to show 40% off until April 11th Hurry. 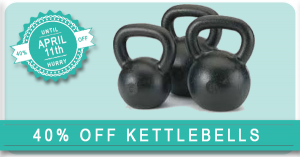 I changed the text on the front to simply say “40% off kettlebells”. It took me about 2 minutes to produce the graphic for the Facebook Ad since I was using the resources that came from the free graphic file from Teespring. Now that I had my graphic I just need to create my ad on Facebook. I am not going to give you a course on how to create Facebook Ads because I am assuming you know already how to do this. Facebook Ads now have 3 tiers for Campaign – Ad Sets and Ads. 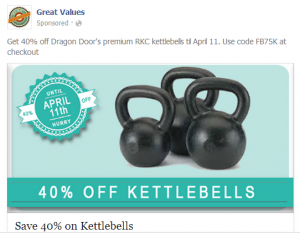 I created a Campaign and called it DragonDoor Kettlebells – CTW. The CTW is my shorthand for clicks to website. When you create a new campaign you tell it what is the purpose of the campaign. Clicks to website is just one choice you can select. I want to drive traffic to DragonDoor so this is why I selected Clicks to Website. Next I created an Ad Set which I appropriately enough called “DragonDoor”. Since there is a time limit for this promotion I made sure the campaign ran from April 10th 5:00 AM to April 11th 10:59PM. The promotion ended at 11:00 PM CST on April 11th which is why I chose to run the ad up until 10:59 PM on April 11th. I budgeted $10 per day for my ad spend. My target audience was 72.000 people. Here is the Ad I created. I spent a grand total of $10.62 on Facebook Ad during the 48 hours that my ad ran. I earned $71.25 in commissions from Dragon Door. This is not bad when you consider it took me about 3 minutes to create the graphic and about the same amount of time to create the Facebook Ad. For about 10 minutes of work I generated $60.63 in profit in less than 48 hours. Let me know if you have used Facebook Ads to promote affiliate products? What were your results? I know some affiliate program prohibit search campaigns. Have any run into any that prohibit social campaigns? Also, have you had any issues with Facebook allowing affiliate links in ads? Most of the programs for which I am an affiliate have a restriction on using Google Adwords to promote their product. None of them (to the best of my knowledge) have a restriction on using Facebook to promote your link. I have not had any problems with Facebook with my ads. Fabulous! Thanks for the followup. Great post! How do you target those who purchased fitness products? You look under behaviors. You will see buying habits and one of the option is people who have purchased fitness related products. Thanks for the reply, Jennifer. It’s so strange – I don’t have it. All I get is “digital activities”, and under that – “online spenders”. I have also seen in behavior category of FB Ads.Like Sara there is no options of Fitness or Active Card User under behavior field. Then that feature might not be available yet in your country. Can you use amazon affiliate links in facebook ads? I believe the answer to that questions is yes. If you are an Amazon affiliate and you have the affiliate strip enabled, when you are looking at any product on Amazon you see where you can “link to this page”. This is where you would normally pull your affiliate link to that product. If you look to the right of that you will see a “share” link where you can share that product on Facebook or Twitter. Once you shared it you can then promote that post or run an ad. Do you usually split test mobile vs desktop traffic? Also how did you select an AND interest “exact interests of Dragon Door and Crossfit?” Mine only does an OR statement. Behavior targeting is defined in an adgroup’s targeting spec field. To define behavior targeting, use the behaviors targeting option. All behaviors will have a logical-OR relationship with each other, and a logical-AND with any other targeting option defined in the targeting spec. I can’t find the reference now, but I think you mentioned that you were able to get cheap clicks with a larger audience. Going broader may reduce your ROI, though. Can you expand on what you meant there? What bidding model do you use, such as CPC, CPM, or oCPM? I hope you continue to do well with Fb advertising! I have found that small audiences result in lower CPC. If you watched Don Wilson’s first video you noticed that he would put in all of his interests and then he would remove the largest two leaving others. I have always used oCPM. I am going to start split testing with others. that’s an interesting read… And it depresses me a bit! Not sure if you’re aware that FB ads don’t work the same in every country. Here in the UK, we don’t get nearly as many options of targeting as you US folks do. For example, we only get limited (and mostly useless) behaviour options, that don’t include all the purchase behaviour related things that you and Don Wilson are talking about. However, I may give affiliate marketing on facebook a go anyway. I have a question. Do you need a fan page to run ads? Can I promote affiliate links without being attached to a business/fan page? If you want to run newsfeed ads then you will need a fanpage. If you want to only run right hand side ads only then you do not need a fan page. To promote affiliate links with a fan page you can only do it thru right hand side ads. But you can create a fan page with no posts to it and run ads to the newsfeed through it. I know some I can such as teesprings, but not sure about others? any clues you can give would be much appreciated. From what I understand you can link out to any website. But what I would recommend doing is to install some sort of redirect like prettylinks on one of your WordPress websites and send the link to your prettylink on your website which then redirects to your affiliate site automatically. This gives you better tracking data on the success of your ads. Great post. I am getting into affiliate marketing backwards in a way. I have been using facebook ads to promote my own products, but would like to try affiliate marketing in my spare time. Where can I find great offers like the one from dragon door? How do you go about choosing good ones? You can easily find offers for affiliate programs by first finding out if products you use have affiliate programs. It is easier to promote something that you use and know and love than it is to promote something that you have never used. Thought don’t just limit yourself to products that you have used. When you go driving look at products being sold and in stores and being advertised. Also, am I allowed to use this method with amazon affiliate links? Or will amazon ban me? Just answered your question above. Great simple, step by step case study! Facebook advertising is something I have wanted to start for a long time but never have the time to sit down and actually start experimenting with. Can I ask, have you tried promoting dating offers on FB? Apparently, people where/are making a killing promoting these types of offers on FB. Its a very easy sell. I have not tried promoting dating offers on Facebook so I cannot give you any feedback on that topic. With millions of users daily accessing Facebook it is easy to see why people like to advertise on this platform. I am from Pakistan.Can you please guide if I have to search for popular products to promote through fb Ads which are high in demand let say for women in NY,Chicago,Miami etc then how can i check them. It does not matter where you live because you have items and products that you use and would recommend in your country. Now if the exact same brand is not available on Amazon then find one that is equivalent and promote it. You can use Audience Insights to check location when you set targeting to see if there is a large percentage of women in selected cities or states. Thanks Jennifer for your response. You might want to ask yourself why you are limiting yourself to only new products? With new products it is a crap shoot as to whether or not they will be popular. Here is something you can use to judge products. The rule of thumb is that on Amazon they sell 50 copies of a product for every 1 review left for that product. If you find a product with hundreds or even thousands of reviews then you know that product is selling well. That is how you can find products to promote. I wanted to be able to AND 2 behaviors on facebook. For example, to market to people that are online buyers and own an iphone 6. But like it was said before the default is OR. How do I market to both people that spend online AND have an iphone 6 instead of have an iphone 6 OR spend online. So I’m looking to AND 2 or more behaviors. The AND option would give me a much better targetted list because if they have an iphone 6 and don’t spend online it doesn’t do me any good and if they spend online but don’t have an iphone 6 it doesn’t do me any good. But if they have both behaviors they are much more likely to buy my product. Do I have to be a developer to change this or is there some other way? Right now the only way to do an AND in Facebook ad using the ad manager is to use behaviors. According to Facebook the use of behaviors will AND with your interest. So if your interest was iPhone6 and you have behavior of online buyer then this will be an AND. The only way to day with ad manager to get an AND is to add behavior. If you have two interests then this would be an OR. There are PMD developers that are offering access to AND through the API but to get that feature you have to purchase their product. HI, how and where do you find affiliate products ? I try to first pick products that I am familiar with. Just using that criteria alone you could easily find 100 products that you use on a daily basis to promote. The best places to go are ClickBank, Amazon, Rakuten, SahreaSale and Ebay. You should also choose your products wisely. Make sure you do your research about your target market. Furthermore, sell something you would actually use or have interest in. Because selling something you have no interest in is not easy and will not appear trustworthy to your visitors and you will not make too much money. Do you need to have a separate Pages in FB to do these ads? I would prefer not to do them under my direct name as I am a licensed professional. Also, could you review the process again? Many thanks, Love your blog! 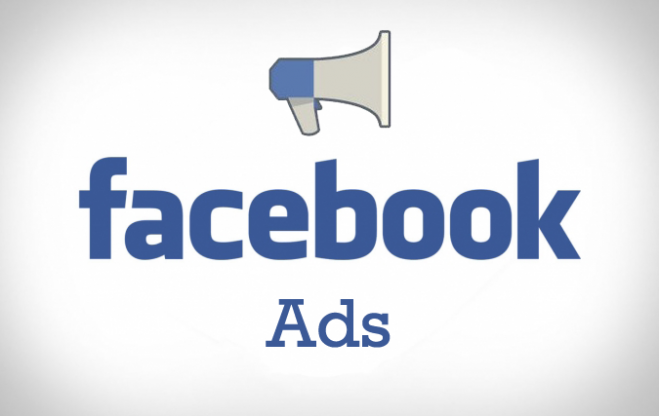 If you want to run Facebook Ads in the newsfeed then you will need a page. You cannot run them from your personal Facebook profile but instead need to create a page. You can create a page on anything for example “Georgia Bulldog Fan Page” or “Underwater Basket Weaving Page” and then run ads from them. Jennifer where are you now? Hi, GREAT ARTICLE. but the download link to the psd file didn’t work. can I get an update? First and Foremost thanks for such a Wonderful Post.. I really Liked it! Now i wanted to ask that is there a way through which i can promote clickbank, offervault or any other products with Facebook Ads Objective of “Click to Website” directly linking to the Offer Page? Because i don’t want to Break my Audience by roaming them here and there and then finally lead to the landing page..
Facebook frowns on affiliate URLs and bans them now and will shut you down, their automated security at least. So, you have to cloak the URLs. Never use an affiliate URL directly in the FB Ad. It’s good that you made great success with Facebook ads, I have tried the same thing but not getting satisfactory results, seems like the “online spender” option is missing from the behavior tab in FB, Any help on that will be Appreciated. The issue here is that you cannot add text on the Image. It is against Facebook advertising guidelines. I got one of my ad accounts banned for the same reason. Also, I have a query, is it fine to send the user directly to the offer page? Which means can I directly run a paid campaign for an affiliate link? Their Associates Program Participation Requirements page states: “You may not display Ads on sites that are not your Site.”, and their operating/agreement pages states: “You must clearly state the following on your Site or any other location where Amazon may authorize your display or other use of Content: “We are a participant in the Amazon Services LLC Associates Program, an affiliate advertising program designed to provide a means for us to earn fees by linking to Amazon.com and affiliated sites.”.” Which I don’t see that you did on your ad, nor how you would. Not trying to throw water on this post, because I would like to use facebook ads to sell via the amazon affiliate program. So as the last comment was about 4 years ago has amazon changed this? Or am I interpreting their pages incorrectly? Thanks. 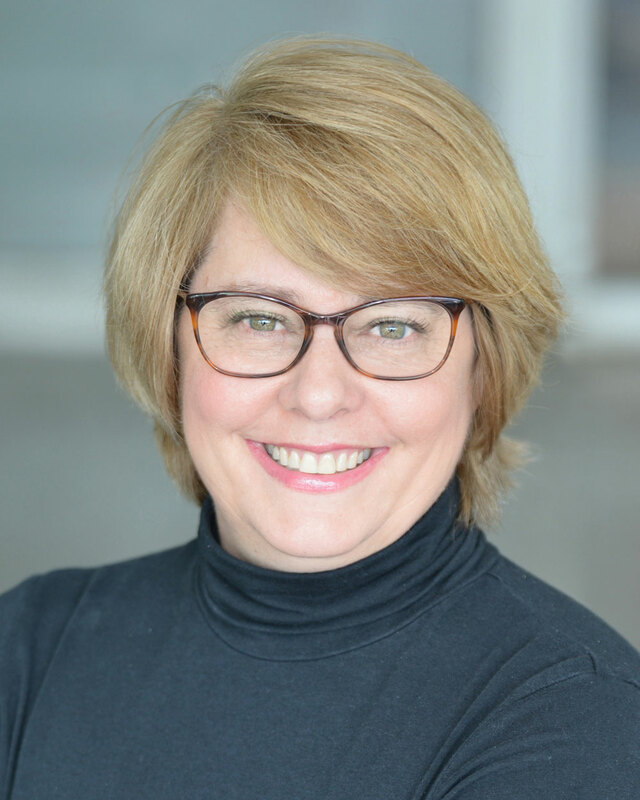 Hi Jennifer – I have an Amazon Affiliate account – can I just create a Facebook Ad on my personal facebook account that directs traffic to the Amazon product without a separate website or facebook page? Is that how you did it? HI Thanks. I have a 15 dollar payout for providing a free month to my followers. Should I post an Ad or is boosting a post a good way to get my offer out their. I have around 4000 contacts on Facebook from friends and like page. Most of the contacts friend of friends would be interested in the product was well. So thats why I was interested in boosting the post and having a separate ad for the ads manager.